I began making cakes for my daughter just to see the delight on her face each birthday. We had a few chats about how some people don't have a lot, even on their birthday, sometimes not even a cake. We decided Cake it Forward would be a great way to bring delight to people who don't have a lot on their special day. We were lucky to find Angel Tree, supporting families with a parent in prison, and now we donate birthday cakes to kids with a parent in prison and support other great causes each week. We create beautiful custom cakes for weddings, birthdays, anniversaries, baby or bridal showers, or just for the love of cake. Every cake we make at our Lower Hutt cake kitchen is designed with you in mind. We take your ideas, add our magic and produce a creation that tastes as amazing as it looks. Our cakes and cupcakes can also be made vegan and are just as delicious. If you're looking to learn a new skill, our cake decorating classes will teach you how to decorate a masterpiece, with everything provided, just turn up, create and take home your creation. We run private cake decorating classes and cupcake decorating parties for kids and adults too - perfect for birthday parties, bridal showers and corporate team building events. 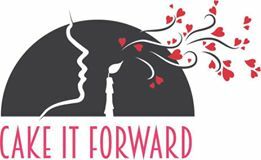 From simple and elegant, to outrageous and spectacular, Cake it Forward's cakes will fill your belly and your soul.